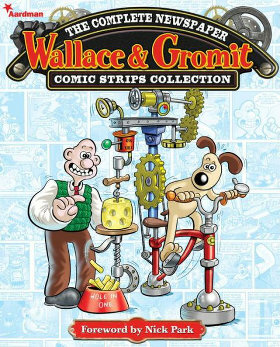 Unlike the traditional British comic-strip Annuals, which were a mixture of cartoon-strip stories, children’s games such as puzzle mazes and connect-the-dots, and short text features (I had Annuals going back to Rupert Bear and Pip, Squeak & Wilfred in the early 1930s), Wallace & Gromit: The Complete Newspaper Comic Strips Collection is an American-style strip collection that reprints the newspaper strips and nothing else. About the strips … I confess that, while the mini-stories work, the collection may be too much concentrated British working-class humour at once, with an emphasis on really lame groaner-type puns. Some of the story titles are "Hear Muffs", "Jurassic Lark", and "Raiders of the Lost Bark". It definitely helps to know contemporary British slang. Fortunately, the visual cartoon panel makes each bit of slang dialogue clear. This book is more for the Wallace & Gromit fans, and for students of modern British humour, than for the average American comic-strip fan. If the animations have made you curious for more details of Wallace & Gromit's home life at 62 West Wallaby Street, here they are. Still, it’s more international in spirit than the older British cartoon-humour Annuals – Nick Park, in his Foreword, says, “… in fact, I’ve just bought an old Beezer annual from 1966 on Ebay, with ‘Colonel Blink, the Short-Sighted Gink’ on the cover – I don’t think you could get away with that today!” Take these 52 mini-stories/312 strips in small doses, and you’ll be right, lad!